One of the most interesting dates for me was the IATEFL Learning Technologies SIG's PCE (Pre-Conference Event) , where a whole day was spent looking at IWBs from all angles. 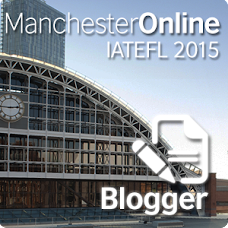 I have already written a post about the event on the iTILT website, but here I want to take a closer look at the discussion led by Luke Meddings on Dogme ELT and interactive whiteboards. 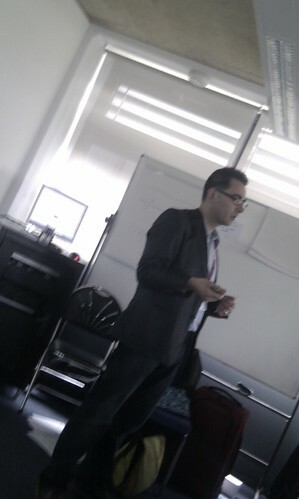 Luke Meddings didn't run a workshop on IWBs at the IATEFL LT SIG PCE. It was a discussion on 'Dogme ELT and IWBs' and I invited Luke to lead it. The reason why I did so? We'd invited Scott Thornbury to speak at the Unconference/PCE in Harrogate and this was a follow-up to this. Scott's part in the PCE had gone down so well, it struck me that we could do something similar the year after, and so I tentatively proposed this to Luke at the 2010 IATEFL conference, and he said yes. I have to say, he had his reservations, and I did wonder if he'd feel the same way when I approached him months later to have his confirmation. I'm happy to say that he is a man of his word and he agreed to lead the discussion. 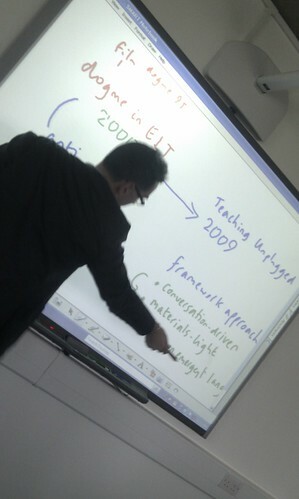 On the actual day, Luke took the pen of the SMARTBoard (for the first time in his life) and led the discussion. The notes he took on the board can be seen here. I'd like to applaud his bravery for accepting my invitation. Aside from the discussion, I was also very impressed at his participation during the PCE. He attended the whole event, was an active participant in the other sessions and took part in the panel discussion at the end. He was also true to himself and his approach to teaching. Like all fine educators, he approached the day with a very open mind, and although I don't think he left with the idea of teaching with an IWB, I think he was more able to see the ways that a teacher could use the tool to promote emergent language, and could see some of the benefits that using an IWB for this type of teaching (the ability to record everything on the board to look at later, for example). I really think we need more of this. I for one have had enough of the 2 warring camps and the 'Tech vs Anti-tech' argument - I think we really have moved on. It's no longer a question of whether language teachers should use technology, but that teachers should use it judiciously and only when it advances the language learning in the classroom. There have been a number of posts (by myself, Nicky Hockly here and here, Sue Lyon-Jones) on this. I also think that more teachers need to do what Luke did. Too much at conferences you see the same presenters talking to the same audience (preaching to the converted) about the same things. One of the reasons why the LT SIG got Scott and then Luke in to talk at the PCEs was to break this cycle - we should all be open to new ideas and to learning about what other 'special interest groups' can offer. This is also one reason why I went to the excellent Teaching Unplugged conference in Barcelona - I think the Dogme ELT approach has a lot to teach those of us who are interested in using technology in the language classroom, if we are open to listen to what is being said. Update: Luke Meddings has also written a post about this.